The first Republican gubernatorial debate, replete with repeated references from all three candidates to Texas’ greatness and the need to defend Texas sovereignty, points to one of the most fascinating aspects of contemporary politics in this state: even as the numerous technological innovations and societal changes of the last 30 years have made people, goods, and media around the world less tethered to geographical locations than ever before, Texas identity remains alive and well and continues to play a critical role in the state’s politics. While Texas politicians have a long history of invoking Texas pride and Texas uniqueness in their speeches, the persistence of Texas identity ultimately lies in the thoughts and beliefs of the ordinary residents of this state. This begs a number of interesting questions — what percentage of Texas residents strongly identify with Texas? What about identification with other geographical areas, like the American South or various hometowns and cities? What percentage of Texans have been so affected by globalization that they don’t identify with geographical areas at all? 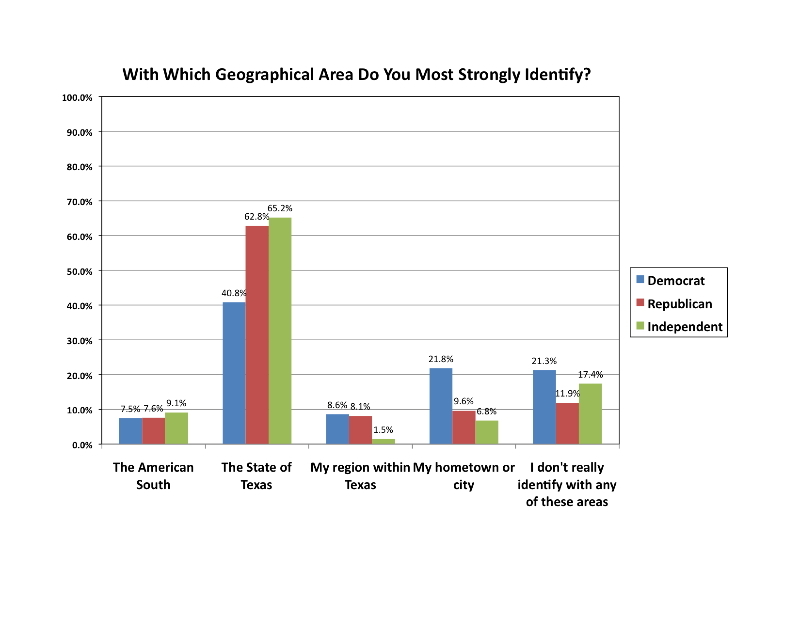 What demographic factors are associated with geographical identification? As Table 1 (below) shows, a staggering 54% of respondents opted for the second choice: “The State of Texas”. No other option came even close to being as popular. Clearly, then, when politicians make constant references to Texas pride, they are seeking to tap into a very real sentiment that continues to exist within the general public. But who are the 54% of respondents who strongly identify with Texas? What about the 17% of respondents who appear to be “trans-geographical” in their identity, or the 15% of respondents who prefer to identify with their local area? Crosstabs of the results by several demographic variables can help us to learn the answers to these questions. As Table 2 (below) shows, Republicans and (interestingly) independents are more likely to identify with the State of Texas than are Democrats. Democrats, on the other hand, are more likely than Republicans or independents to identify with either their own hometowns or cities, or with no geographical area at all. This makes sense when one considers which candidates are constantly making references to “Texan-ness” in their primary campaign speeches. Rick Perry, Kay Bailey Hutchison, and Debra Medina are doing this far more than either Bill White or Farouk Shami, and considering the parties’ respective primary electorates probably goes a long way toward telling us why. Now look at Table 3 (below). It displays crosstabs for the geographical identity question by rural/suburban/urban residence. 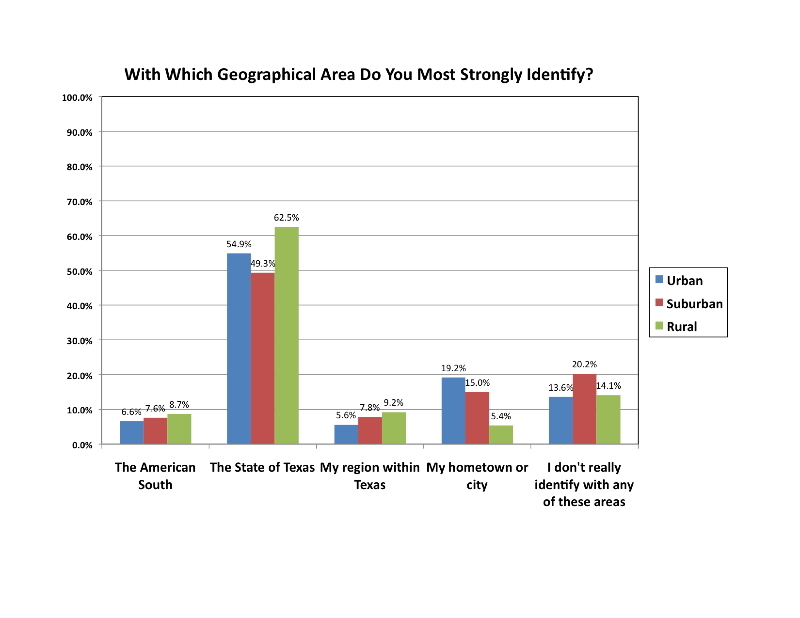 As can be seen, rural Texans are the most likely to identify most strongly with Texas and suburban Texans are the least likely. Suburban Texans, on the other hand, are the most likely not to identify with any of the answer choices given. This probably has to do with the fact that many suburban Texans are recent migrants from other states and therefore have little connection to any part of Texas. Not surprisingly, urban Texans are the most likely to identify with their hometowns. But perhaps the most interesting of all the tables is Table 4, which displays crosstabs for the geographic identity question by how the respondent arrived in Texas. 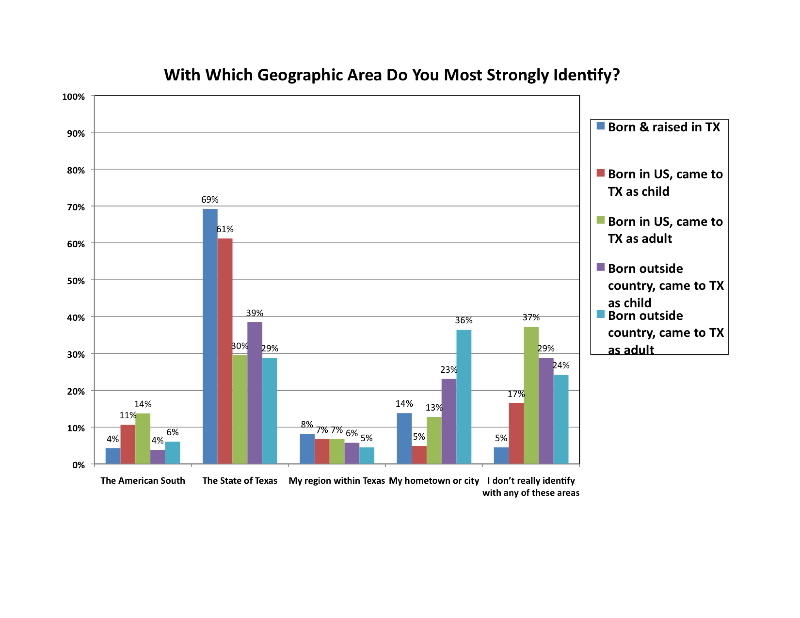 As the table shows, residents who were born and raised in Texas were the most likely to identify most strongly with Texas, but not far behind are those who were “born elsewhere in the US, and moved to Texas as a child.” Residents who came to Texas as adults (whether from another state or another country) were far less likely to identify most strongly with Texas, and residents who came to the US from another country as children were also less likely (though not as much so). 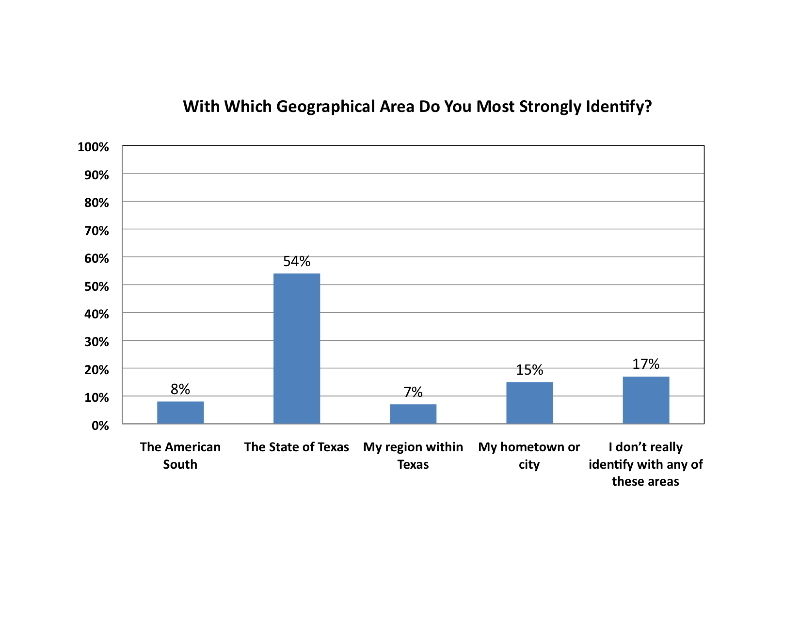 Residents who came to Texas from another state as adults were far and away the most likely to not identify with any of the answer choices — this makes sense, as these respondents likely constitute the most highly mobile and trans-geographical category. Interestingly, however, residents who came to Texas from other countries as adults were far and away the most likely to most strongly identify with their hometown or city. The fact that both native-born Texans as well as those who came to Texas from another state as children are so much more likely to strongly identify with Texas than the other groups suggests that Texas identity is in large part forged in school, especially in grades 4 and 7 when students are required to study Texas history in social studies class. After all, if it was family heritage that gave Texans their Texas identity, we would expect only native-born Texans to express that identity in large percentages. But there is another wrinkle — the fact that Texans who came here as children from another country don’t most strongly identify with Texas in high percentages. For some reason, it appears that the experience of going to school in Texas does not give immigrant children as much of a Texas identity as it does to students who were born in this country. This article originally appeared in The Texas Tribune at http://www.texastribune.org/2010/01/19/texans-are-proud-of-where-theyre-from/.